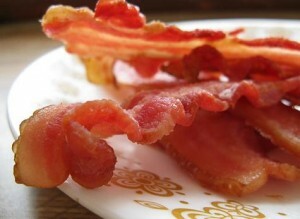 Standing on the Shoulders of Giant Bacon | Thill Logistics Inc. So you’ve been sitting idly in your chair on an early Thursday morning. The burning red numbers of the digital clock on the counter start blurring as you try desperately to put something more in your word processer. For the last three hours, your ten-page term paper about the impact on post-modernization on the production and consumption of bacon lays barren except for the single line, “Bacon is yummy.” Is all hope for capturing a creative muse lost? Not at all! In fact, the key to being creative is simply being B.A.C.O.N. BOLD – When it comes to being creative, nothing should be considered off limits when you are initially brainstorming ideas and thoughts. Be bold with your thoughts up front, otherwise you risk limiting yourself in your creative endeavors. Something that you or others might think is a silly idea now, might lead you in new directions later on. Only after you have come up with your ideas, should you start to fine tune them with the constraints of resources and money. ANALYTICAL – Being analytical may seem counterintuitive to being creative. Analytical people are often portrayed as soulless robots or fact zombies. Creativity, however, is just as much a skill as it is an innate talent that people can possess. Sure, some people are just “naturally creative”. But that doesn’t mean that we cannot work to improve our skills of creativity. Look at what others have done before you. Expand their ideas with your own and take ownership of that new fledgling idea. Isaac Newton wrote, “If I have seen a little further it is by standing on the shoulders of Giants.” In that line, Newton comments that he had only achieved so much because of the hard work and ideas of those before him. CHALLENGING – Challenge yourself daily to be more creative. If you like cooking, go out and buy a vegetable that you have never tried cooking before and prepare it. If you are a writer like me, try rewriting something you’ve written using other writer’s “voice” (someone like Steinbeck, Hemingway, or Austen) or maybe in a genre you haven’t written in before. One of my creative challenges is using a new word every day in a story, blog, or in spoken form. Exercise your mind as you would exercise you body. Need a little help? You can go out and purchase word or picture puzzles. And there are many resources online as well that will help you keep your creative mind sharp. Like with any challenge, always give yourself a reward for doing something successful. And then set a higher goal for the next time. OPTIMISTIC – Nothing kills creativity better than a negative attitude. Negativity toward something can lead to Distress (the bad type of stress), whereas positivity tends to lead to Eustress (the healthy type of stress). Eustress can give you that spark that creative people are often associated with. It’s that burst of adrenaline that gives you energy, clarity, and focus, which helps in the creative process. Maybe that’s why we always feel more creative after a soda or a cup of coffee in the morning. Just remember though, these are artificially enhancing your Eustress levels. And a positive attitude doesn’t have the crash that a can of Red Bull will. NAKED – Okay, I admit, I’m only really using this word because it is my challenge word for today. But I thought it was creative how I incorporated it into this blog, don’t you? Now before we all start heading for the French Rivera, let’s recognize that the word can also mean, “Without embellishment”, or “to be simple”. Now, I know this may sound like I’m completely contradicting the statement regarding boldness, but you can still be bold of thought and simple with the task at hand. If a project seems to be too big to handle, “strip it” down to smaller, more manageable tasks—the “bare essentials” so to speak. Attack each task as its own individual problem. This entry was posted in Pauls Blog and tagged Blogging, Challenge, Creativity, Paul Salzer, Pauls Blog, Writing. Bookmark the permalink.